How we resisted war in 2018! War Resisters' International has been as busy as ever in 2018! Here's a quick summary of some of the ways we've been supporting our international network to resist war and it's causes. 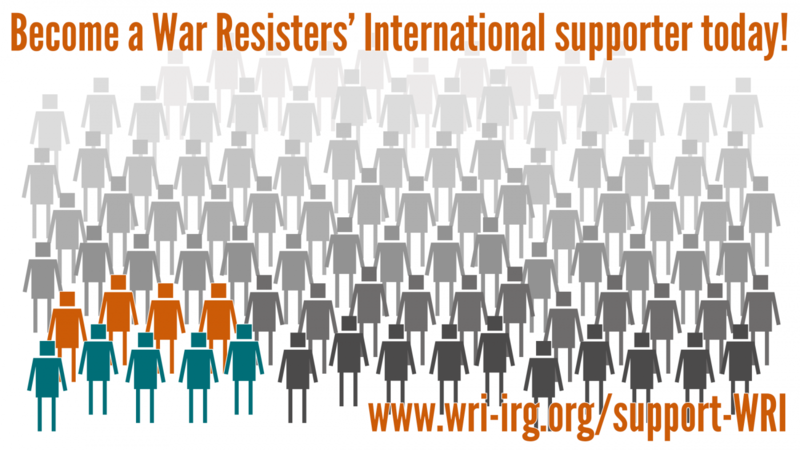 Our work relies on the kind support of donors from around the world - could you consider a donation to War Resisters' International? Donate to War Resisters' International today! We're very excited to have recruited a new staff member in Colombia. Natalia joined our small team in September, and will be working on our Right to Refuse to Kill Programme. Welcome, Natalia! Our annual Conscientious Objection Day (which always falls on 15th May) focused on South Korea and the work of our affiliate World Without War, who are waging a campaign to end the imprisonment of conscientious objectors. The right to conscientious objection is currently not recognised in South Korea, and refusers often serve a long prison sentence. Members of the WRI network held solidarity actions at Korean embassies around the world, and sent messages to Korean embassies in their own countries. In the UK, we gathered hundreds of action postcards and delivered them to the Korean embassy in London. This year, World Without War also published our book "Conscientious Objection: A Practical Companion for Movements published" in Korean. We have also been regularly supporting conscientious objectors in Israel, where a number of young people have been imprisoned for refusing to join the military. Our CO-Alert system allows members of our network to quickly demand the release of imprisoned objectors, and you can sign up here: www.wri-irg.org/subscribe On Prisoners for Peace Day (1st December) we distributed the contact details of people imprisoned because of their peace activism around the world, and encouraged supporters to write letters to them. Click here to donate to WRI! The fifth annual week of action against youth militarisation took place in November 2018, with actions taking place all over the world. In Turkey Nonviolent Education and Research Association organised a public forum with young people on how to promote nonviolence among youth in the country. In Colombia a number of groups organised a public forum on the experiences of conscientious objectors and how to promote conscientious objection among young people in the country. In the UK, a number of of screenings of War School - a documentary explaining the promotion of military and military values in schools across Britain - took place. In Italy, Movimento Nonviolento activists organised an online action posting their protest messages against the militarisation of youth in Italy and elswhereIn Greece, the feminist collective Το Μωβ (the Purple) activists organised a nonviolent street action. As well as supporting conscientious objectors, World Without War support a network of nonviolence trainers. In December, staff from WRI's Nonviolence Programme traveled to Seoul to run a training for trainers for the network. The training focused on supporting activist organisations in developing strategic campaigns. The biannual Eurosatory arms fair is a key event in the arms trade calendar - it is one of the largest events of it's kind, with hundreds of companies taking part. To support the grassroots resistance to the fair, we published a short guide to some of the arms companies participating in the fair, detailing the weapons they sell, the places they sell them, and outlining some of the impacts. The guide was distributed to hundreds of activists, journalists, and members of the public by our friends in the Stop Fuelling War coalition. Can you support our antimilitarist organising? Click here to donate. In January, our Countering the Militarisation of Youth programme held a training for European activists taking action against youth militarisation. The event was held over a weekend, with members of our affiliates in Finland, Germany, Spain (Catalonia), Czech Republic, the United Kingdom, and Italy taking part. In May, a similar event was held in Cyprus, with participants from both South and North regions of Cyprus joined by Greece, Israel, Russia, and Turkey. Both trainings were followed by public events which gave the opportunity for participants to share their experiences of resisting youth militarisation more widely. WRI relies on our supporters - donate today! Empowering Nonviolence is a new website we built in 2017 to hold all of our nonviolence resources - it is available in lots of languages and has material on strategic campaigning, effective actions, and training exercises. In 2018 we've published lots of new material, including guides to video activism or using theatre as part of an action, and new case studies from Afghanistan, Germany, and India.